Here a a couple of seaxs I finished last week. The blades are of course by Owen Bush, the rest is by me. The smaller seax was made for a customer as a complete job, the larger was a blade purchased by a customer direct from Owen and sent then to me for hilt and scabbard. 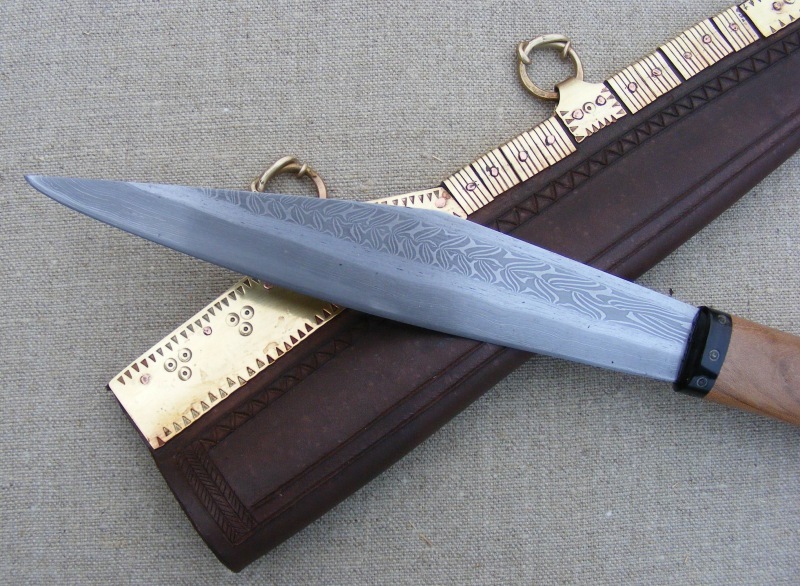 The smaller seax has a horn and elm handle and a vegtan scabbard with brass fittings. The blade is 9" long and secured in the handle with a pitch/rosin/beeswax blend. 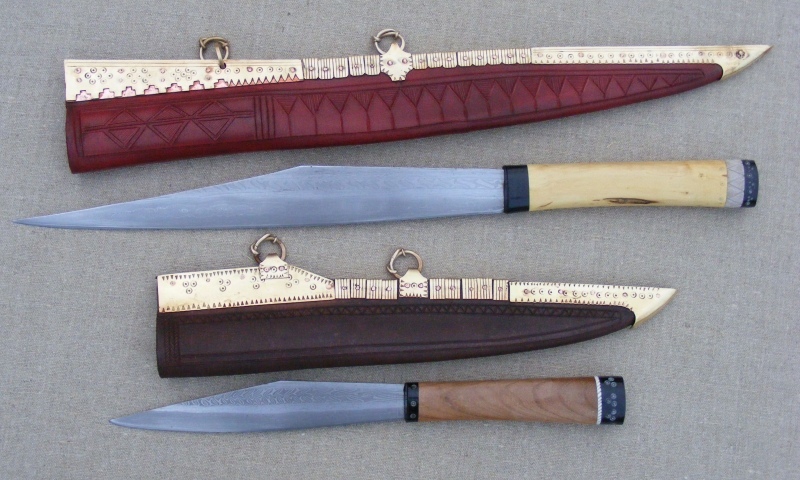 The larger seax has a horn, boxwood and antler handle and a vegtan scabbard with brass fittings. 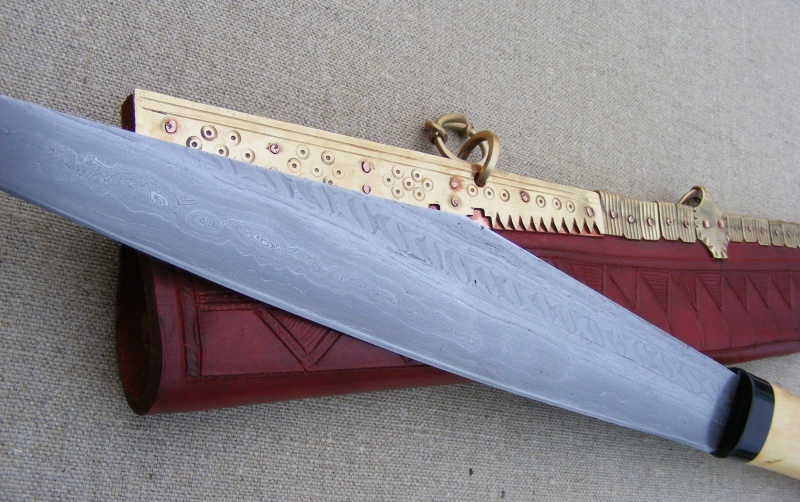 The blade is about 15" long and secured in the handle with a pitch/rosin/beeswax. Both knives are very formidable pieces and I hope you like them. I will let Owen fill in any further information about the blades, but they are recent pieces of his where he is building blades from combinations of wrought iron, shear steel, piled steel, and twisted bars. beatiful work. I have a couple of Owen's blades. I must say you really finish Owen's work off well. Drool....drool..drooooool. Wow. Those are impressive! Your stuff just gets better and better Tod! The bigger one is just ! Great work as always, I was wondering what kind of tool did you use to get the straight lines in the brass plates. I know the other shapes are stamps. I don't know about Tod, but I use ground down cold chisels and bolsters. Lovely work Tod; stunning blades too Owen. Thanks all, I appreciate it. I made a little roller rig for the grooved plates. Tod, what era would you date these?